Having procedures in place for an unexpected interruption to your water supply can mean the difference between continuing your business as normal and making a significant loss of profit and productivity. Water Direct can provide water for facilities management purposes with our contingency planning services. This prepares businesses for unexpected water supply interruptions. In an instance where your water supply is unexpectedly interrupted we can help by pre-empting what kind of temporary solution would best suit you and your company’s needs with our water supply continuity and disaster recovery system. 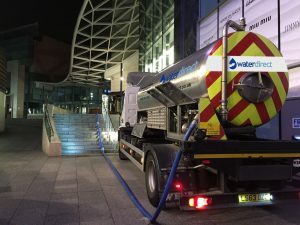 A site visit can help us decide what would be suitable, whether that be a water tanker remaining on site to pump water straight into your system, to fill storage you already have on site or to provide temporary storage tanks to supply your site until a clean mains supply has been reinstated. We can also offer bulk bottled water in this instance which can be a much more effective option for you if water is just required for drinking. Delivered by the pallet, our bottled water is also suitable to be stored for later use should you not use up the full supply.